Candida is a bacterium that lives naturally in your body. It thrives in moist dark places like your intestines. 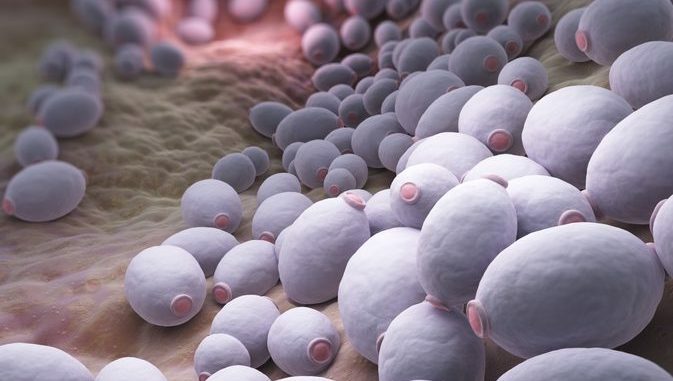 An overgrowth in Candida can cause real problems like chronic fatigue, weight gain, vaginal and skin infections and even complications with your immune and metabolic systems. There’s good news however. Often with a few dietary changes you can reverse Candida overgrowth. Let’s take a look at how your diet affects Candida. There are two keys to modifying your diet to affect Candida. The first is fibre. Candida, as we mentioned, lives in your digestive tract. When you don’t get enough fibre what happens? You stop going to the bathroom as frequently as you need to. Your bowel movements are reduced. And even when you have bowel movements a lot can be left in your intestine because you don’t have the fibre to clean your system. The result is that you create a fantastic food source for the Candida in your body to grow and thrive on. What’s the cure? Eat more fibre. Make sure you eat plenty of fruits, vegetables and whole grains each and every day. Get your body and your digestive systems functioning optimally. The second way your diet can have a profound effect on Candida overgrowth is sugar. Candida thrives on sugar, its Candida’s main food source. So when your diet is full of sugar, you’re feeding the Candida and helping it take over your systems. Interestingly enough there are many other foods that your body treats just like sugar. They include alcohol and other fermented foods. Foods that are pickled and foods that are fungus like mushrooms and yeast. Additionally dairy foods which contain lactose are also fuel sources for Candida. How do you modify your diet to eliminate sugar and starve Candida? The first step is to actually go on a sugar elimination diet or a Candida diet. This will require you to eliminate all sources of sugar, from doughnuts to fruit, from alcohol to cheese. Don’t worry, you don’t have to eliminate these foods forever, just until the Candida dies and leaves your body. Once you’ve eliminated the yeast overgrowth you can resume eating most foods as long as you keep sugary foods to a bare minimum. Each body is different and your body may be more sensitive to Candida overgrowth. If you suffer from Candidiasis you are not without hope. A few dietary changes including adding fibre to your diet and eliminating and reducing sugar will help you get control over Candida proliferation and subsequent Candida symptoms. Candida doesn’t have to be a lifelong affliction. Take a good look at your dietary habits and make some lifestyle changes to support optimal health. Following a Candida diet is hard, I know because Ive followed it myself! There will be times when you want to give in but please dont. Think about the symptoms you have and how good it will feel to be rid of them. That should be enough to motivate you to carry on.